One of the newest colors in...well...all things is Greige. It's a hybrid of gray and beige. You see it everywhere from shoes to nail polish and now, it's making its way into home decorating. Today's Monday Space post shows some beautiful ways to decorate your space with Greige. 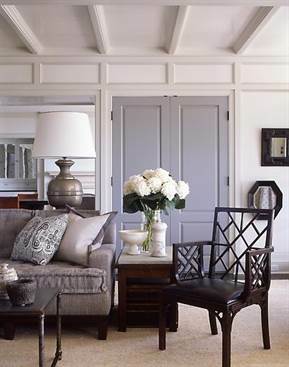 Greige is gorg when balanced with dark wood and white. 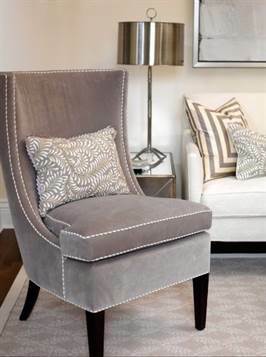 Shades of Greige with chrome, black and white accents are very chic. Greige and gold are also very posh looking. I LOVE this room with the mercury glass lamp and rattan shade against a Greige wall. Beautiful! What do you think of Greige? Sometimes I wonder if you're making stuff like this up. Greige? Seriously? You mean the word? Nope!! Google it! There are WHOLE BLOGS dedicated to Greige. So, get your Greige on! Love the color (especially in the first two pics), hate the name. Greige is such an ugly word.